Candy has been a part of courtship and Valentine’s Day since the Victorian area, if not before. Presenting the woman you were courting with sweets was a man’s way of showing he cared and was interested in a woman he admired. Today, Valentines Day candy is given by both men and women, not only to the person they have chosen to partner, but also to their children, parents, and even friends. Dove is part of the Mars Candy Company, and candy created under the Dove name produces a wide variety of chocolate candies, including; milk chocolates, caramel, fruit and nut candies, truffles, and chocolates with folded milk chocolate in the center. 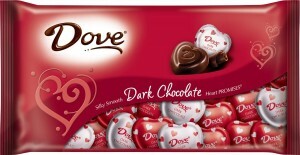 The Dove Valentine’s Heart Promises are one of the favorite candies to receive during Valentine’s. These candies would be perfect placed in a Valentine’s mug, or scattered on your loved one’s pillow. They also make great treats for kid’s Valentine’s parties as well. Most people who purchase this candy think of Dove as an extremely fine chocolate, and the few reviews that have been posted make this clear. Customers not only find these chocolates better tasting than most others chocolates, but they also felt that the packages were incredibly fresh when delivered. These Dove Dark Chocolates Hearts would be perfect when mixed with the Milk Chocolate Dove Hearts Promises, and presented in a cute Valentines Day mug or candy dish. Customers love this Dove Valentine’s Dark Chocolate Hearts Promises and state that these dark chocolate hearts are not the normal Dove dark chocolate, but taste even better than the normal chocolates. In 1852, the Ghiradelli Candy Company struck gold, not in the California gold fields, but selling their premium chocolate candies to the miners who longed for a few luxuries. Today, these same candies are still considered to be a luxury item, and have continued to be a popular choice. 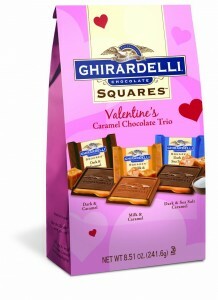 Their Ghiradelli Valentine’s Chocolate Squares Caramel Trio are very popular with Ghiradelli chocolate lovers. If you love caramels and chocolate together, you will find this Ghiradelli Valentine’s Chocolate Squares Caramel Trio Mix irresistible. Reviews for these Chocolate Covered Caramels From Ghiradelli are extremely good, with most customers admitting that these chocolates did not last long once they were opened! Olde Naples Chocolate is a family owned business that has been bringing great tasting chocolates to Naples and the surrounding area for over 23 years. Their offering of the Chocolate Dipped Rice Krispie Treats combine those tasty marshmallow treats everyone loves with hand dipped chocolate. This is a wonderful combination of flavors, with wonderful chocolate coating a crunchy Rice Krispy treat. Customers give these Rice Krispie Chocolate Coated Treats exceptionally good ratings. While they do say that the treats are quite small, they also state that these treats have a big wonderful taste. Since 1847, Necco has been making candy. While most people associate this company with the famous Necco wafers, this company also makes other candies as well, such as Sweethearts, Mary Jane’s, Candy Buttons, Clark Bars, Squirrels, and Slap Stix. 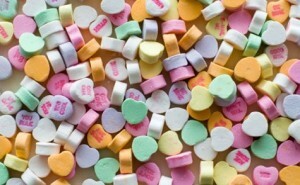 A few years ago, the Necco company decided to change the flavors of their conversation hearts. While many people liked the new flavors, others mourned the loss of the original flavors that disappeared off store shelves. The Original Classic Flavor Necco Conversation Hearts Package is sure to please those who love the original conversation hearts flavors. Conversation hearts seem to have long been a part of Valentine’s Day, and these hearts in the original flavors of Cherry, Banana, Orange, Lemon, Wintergreen, and Grape are sure to be a big hit. Reviews for the Necco Conversation Hearts are good, with most customers admitting purchasing these candies simply to get the original flavors. While customers admit that the candies are slightly over priced, they do admit that they feel it is worth it to get the flavors of these candies they have long loved. In 1876, Milton Hersey started his first candy company called Crystal A Caramels. After visiting the Chicago World’s Fair, he learned about the making of chocolate. So fascinated was he with the process, that in 1984, he began making and coating his caramel candies with chocolates. Other chocolate candies followed, with the first milk chocolate bar being sold in 1900. Almonds were added to this candy bar in 1908, with Hersey’s Kisses making their first appearance a year earlier in 1907, and becoming some of the most popular of the Hersey’s candy line-ups. This 10 Ounce Heart Tin filled with Hersey’s Valentine’s Kisses is a great way to give this popular candy for the holiday. Anyone who loves Hersey’s Kisses will be thrilled to love this beautiful Valentine’s tin. There are only a couple of reviews for this Tin Of Hersey Valentine’s Kisses, and while customers state that the kisses are great tasting, one customer was upset that the tin arrived dented and could not be given as a gift. Valentine’s candy comes in many different flavors and is a sweet way to tell your Valentine how much you love them.